Khyrunnisa. A and P. Vijaya Kumar bond with their students beyond classroom. Sandhya Padmanabhan loved her maths and science. She was sure about what she wanted to do after school. But, owing to her marks, there was a small delay before the admission to BSc Maths came through at the All Saints College that year — a week before she could be sure. That week, she joined the English Literature class, waiting for her opening. She dreaded going to sit in a class she didn’t want to be in, but one week changed everything. Khyrunnisa A., her English Lecturer, changed her life. After sitting in her class, she found a new love for the language and didn’t want to leave anymore. A week later, when they called out the names of students who could switch over to science, Sandhya hid herself in her seat before finally standing up to say she had changed her mind. “I became a teacher and I wanted to imitate her style, but she is inimitable. All of us would vouch for that,” Sandhya says on Teacher’s Day, as she gets ready to send her yearly wishes, which sometimes go out as poems. There have been many like Sandhya whom Khyrunnisa and her husband P Vijaya Kumar – also an English professor – have taught. Students who changed the course of their lives because of these inspiring teachers. The two of them are too modest to admit it. You have to dig deep to find out these stories, as they sit at home in Thiruvananthapuram, reading the many messages that keep coming on their phones, wishing them a Happy Teacher’s Day. After decades of teaching, they have touched too many lives, but they never changed their ways of being two of the most humble persons to walk the earth. “I am not strict in class, though I was inspired by a wonderful teacher called Leela Subramoni who was strict,” Khyrunnisa says. Their teaching method is simple, Vijayan says, “You prepare and you teach.” But the hours that go into the preparation are what make them such favourites among students. “He remembers the name of every student he taught and she can make the driest of subjects so interesting with her humorous ways,” says Nazia Hassan, who was taught by both of them. Khyrunnisa started teaching the day after she had her viva for PG at University College, where they both studied together. “As teacher for classes XI and X at Holy Angels Convent,” she says. It took Vijayan three more months to start teaching at SN College, Alathoor. He switched many colleges, but his longest stints have been the six years he taught at Victoria College in Palakkad and the 13 years at the Thiruvananthapuram Women’s College. Khyrunnisa had a brief banking stint for two years, travelling all over the country with the job, during which the two got married. But she knew her heart was in teaching and came back to All Saints’ and stayed there till she retired. “They can’t escape us,” she jokes, saying how students who leave All Saints’ end up in Women’s or vice versa. They measure their goodness by the goodness of their students. “We had a lot of good students, which means we must have been good teachers,” Vijayan says. He describes a good student – slightly irreverent, keen on studies. “With a spark in her eyes,” she adds. Khyrunnisa remembers the first time Vijayan went as an invigilator to the University College, notorious for cheating in exams. “I relaxed only when the doorbell rang in the evening and he got back. Then he pulls out the innumerable pieces of paper that he seized from the students!” she says. She too had to do that, but she stops them there and doesn’t report them. Trouble also comes from students who bring a disturbing attitude with them. Vijayan remembers a girl who insisted on answering his questions in Malayalam even after he asked her to do so in English, because it was English literature class. She asked him then, what his problem was. Vijayan in his calm way said he wouldn’t have any problem, he would soon retire and have his pension, but she might have one when she applies for a job and can’t speak the language. “Hostility to English came with cultural nationalism. But English is a way to empower yourself, it helps you gain knowledge,” he says. He always found ways to impart knowledge in the hours after class got over. 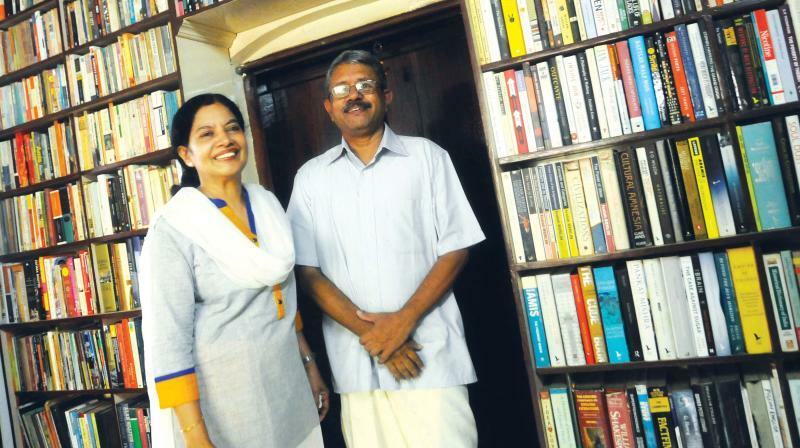 ‘Beyond the Syllabus’ was a programme he put up at the Women’s College, a language lab set up with material from the internet that helped many students coming from the Malayalam medium to catch up. The ‘English Audio Club’ was another activity he began at the Victoria College - Friday afternoon meetings discussing a theme, with the help of poems, songs and text. And at All Saints’, Khyrunnisa had her quiz club. What she loves most about teaching is meeting the students, being in class and knowing the students are enjoying what they listen to. What he loves is preparation. He teaches a course at the IISER now, and a student from three years ago came one day, her hands held behind her, asking what’s new in what he taught. He said he added a new writer to his list, Frans De Waal, and she brought her hands forward, holding one of his books as a gift for the teacher. “It’s moments like these that make teaching so beautiful,” Vijayan says.